Ideal for use in bacteriology, RIA, coagulation and other routine laboratory procedures. Simport uses no mold release agents that could cause errors and interferences in RIA tests. Precision molding with virgin thermoplastics ensures that our tubes are uniform in size and shape as well as being chemically clean and ready to use. 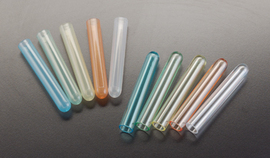 The polypropylene tubes are translucent and will withstand over 3000g during centrifugation. They will also accept most common acids, solvents and alkalies at room temperature. They are almost unbreakable and can be sterilized at 120° C.
Polystyrene tubes are transparent and will withstand centrifugation speeds up to 1400g. Clear plastic guarantees no danger of glass activation during testing. Polystyrene will tolerate aqueous solutions, mild bases and weak acids, but not organic solvents, aromatic or chlorinated hydrocarbons, and cannot be autoclaved. The T400-3ALST 12 mm x 75 mm tubes are made with a specially formulated polypropylene providing a low surface tension to obtain optimum sample yield. No lubricants have to be added, thereby eliminating the danger of sample contamination.